New Wave Domesticity: fun with felt! i added a sew on pinback so it can be displayed anywhere. 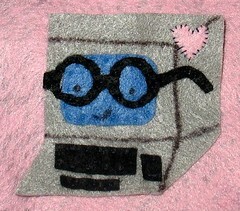 it's just a little cut out with a little hand sewing and it costs just a few cents to make, but i think it turned out adorable and it was super personal for my computer nerd, dorky glasses loving friend. she loved it.